Between the ACE body structure, hands free technology, countless safety features and numerous IIHS Top Safety awards, it’s hard to imagine exactly how Honda could make its vehicles safer on the road. Never one to stand still, we’re now making advancements in the study of crash test simulations to better understand how our cars can withstand impacts and keep drivers safe. Crash simulation technology allows Honda engineers to accurately predict a car’s behavior in a collision and the effect on the occupants, without having to build and test a prototype, leading to faster and more efficient development of safety features. Honda R&D Americas Inc., the North American research and development arm of Honda, has integrated a new way of rendering three dimensional visualizations of crash simulations into their existing crash simulation technology, called LS-DYNA CAE. Traditionally, this technology only allowed engineers limited and fixed viewpoints to observe a vehicle’s behaviour and did not allow for more in-depth viewing of specific components. 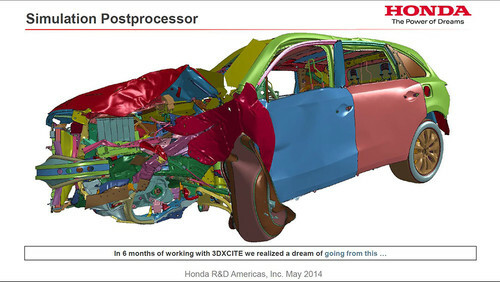 The new software being integrated by a company call 3DXCITE permits Honda designers to rotate the view of the simulation to look at the vehicle from all angles and strip away parts and crash barriers to get a more accurate look at the effect of the simulated crash. While much of this is pretty technical, the important thing is that the integration of the new rendering software will result even better safety capabilities in Honda vehicles, making them safer and safer each time a new model is developed. Honda’s current technology has already resulted in more IIHSA TOP SAFETY PICK+ ratings than any other automaker and we can’t wait to see that trend continue with the development of new and safer designs for you and your family in the years to come!